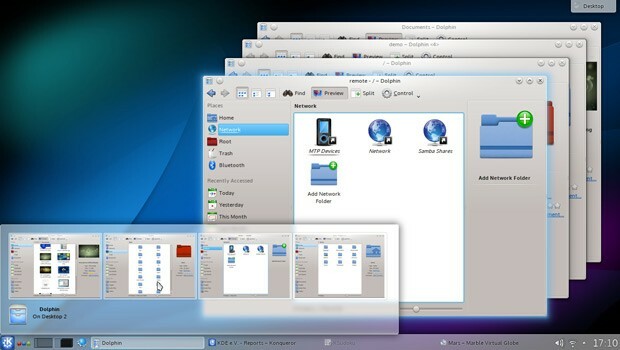 There are plenty of Linux desktop environments to choose from, but if KDE has a special place in your heartware, you’ll be pleased to know its first 2013 update is out. Making the jump from 4.9 to 4.10 brings various tweaks to Plasma Workspaces, including upped support for high-res displays, a streamlining of the default Air theme, and plenty of behind the scenes adjustments. All running software can now be controlled through a common menu system, search indexes happen faster, and the new Nepomuk Cleaner will help rid those clogged drives of unnecessary data. In addition, printer management has been improved, and the enhanced Dolphin file manager communicates more freely with mobile devices. A thorough, lovingly crafted changelog is available at the source link below, but if you’re particularly fond of surprises, then head straight for the download. Happy upgrading!